Jamie Foxx makes The Kingdom worth watching. This movie starts off like gang busters with a fantastic opening credits sequence that recounts the history of Saudi Arabia and its associated international relations, dating back to 1932 and running up to current history. It effectively sets the stage. What takes place on that stage at times feels like a timely thriller, at others like a pandering exploitation flick. The pace stays brisk. In Riyadh, Saudi Arabia, a terrorist attack leaves 100 people dead. Two men in Saudi soldier gear tear through the neighborhood, shooting at anything that moves. At the softball field, a suicide bomber takes down as many people as he can. It’s a harrowing sequence, one that plays off the daily headlines of terrorist bombings and suicide attacks plaguing the Middle East and other territories. 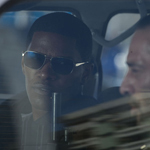 From there, the movie takes a radical shift to Washington, D.C., where Ronald Fleury (Jamie Foxx, Ray) dotes over his young son before getting an urgent call. With the FBI scrambling in reaction to the attack in Riyadh, Fleury swiftly connects with a Washington Post reporter who puts him in touch with a Saudi ambassador and bada-bing, Fleury and a few of his closest, most trusted colleagues are en route to Saudi Arabia on a mission to track down the attack’s masterminds. The clock is ticking; they’ve got five days to complete their mission. But, naturally, the Saudis don’t exactly greet them in a spirit of detente. The Kingdom swings from gung-ho G.I. Joe-style adventure to revenge flick to gripping thriller and back again with mixed results. On the bright side, when its not feeling overly contrived, it does manage to ratchet up the tension. In particular, as the story barrels down on the conclusion, director Peter Berg (Friday Night Lights) generates considerable heat as Fleury and his crew pursue their prey. That crew is something of a Fantastic Four. There’s Fleury himself, a tough soldier and gentle father. Grant Sykes (Chris Cooper, Breach) is the tough, no-nonsense older veteran. Janet Mayes (Jennifer Garner, Alias) is the tough female of the bunch. And then there’s Adam Leavitt (Jason Bateman, The Break-Up), the not-so-tough guy whose most valuable skill seems to be comic relief. On the Saudi side, this globe-trotting A-Team is assisted by Col. Faris Al Ghazi (Ashraf Barhom, Paradise Now). Like Fleury, he’s a soldier and a father. Once the ice breaks between the two, they work well together; Foxx and Barhom hit the right marks with their odd, initially uneasy chemistry. One of the victims in the initial terrorist attack is a well-respected, much-loved colleague to Fleury and his team. That’s really their impetus for going: to seek revenge for a lost friend. That’s fine. They have their motivation. And most James Bond movies also play off contemporary political tensions, using real-life threats as a jumping point for the superagent’s exploits. But with The Kingdom, those exploits start to feel eerily exploitative. Following the movie’s grisly climax, the Americans and the terrorists are shown as having one thing in common: a complete and utter distaste for each other. “We’re going to kill them all” is the shared sentiment. The line is delivered from a grandfather, one of the terrorists behind the Riyadh attack, to a grandchild. It’s also shared as a whisper between a pair of the story’s protagonists. Is it chilling? Most definitely. Does it make for a good movie? Sure. Is it healthy? That’s debatable. And maybe that debate will ultimately lend The Kingdom a greater sense of value.